The sequel to 2011’s bone-snaptastic Mortal Kombat reboot is subtitled X – maybe because it’s the tenth in the series, or perhaps because it’s pronounced ‘cross’, which this fighter most certainly appears to be. Kano, who shares nothing with the Grime MC of the same name but unshakable self-confidence, was one of the seven original Mortal Kombat characters – though over the years he’s featured in fewer sequels that his arena-mates. Probably because he looks like he was designed in the back of a maths exercise book. Mortal Kombat X finds the bearded cyborg a little older, but stronger than ever thanks to an increased dependency on cogs and pneumatic pumps. Like every character in the game, Kano can be played in one of three stances. His Cut-throat variation pounds his mechanical heart to draw on increased attack power. The Cybernetic build excels at long range thanks to grenades and an eye laser. And Commando is all about grappling. The whole thing climaxes in a splurge of shattered spine and unnecessary gore. But if you play Mortal Kombat, that’s what you like. Incidentally, the man in the video, Ed Boon, co-created the original series. His Midway studio has in recent years morphed into NetherRealm. Who founds their studio around a bum joke, really? 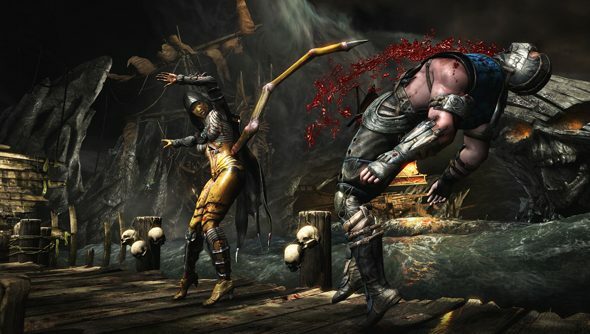 Mortal Kombat X is due out on PC next year.